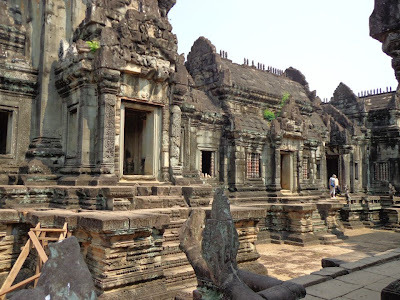 My stay in Cambodia was coming to an end and I was thinking of things to do, and then I realized "why not visit another set of ruins?" since I wasn't templed out it didn't seem like such a bad idea. I took advantage of the tour that the hostel offered, including sunset viewing in Phnom Bakheng, for $28 and paid another $20 for the temple pass. This time around I had a friend to share the expenses with that automatically cut my expenses by half. 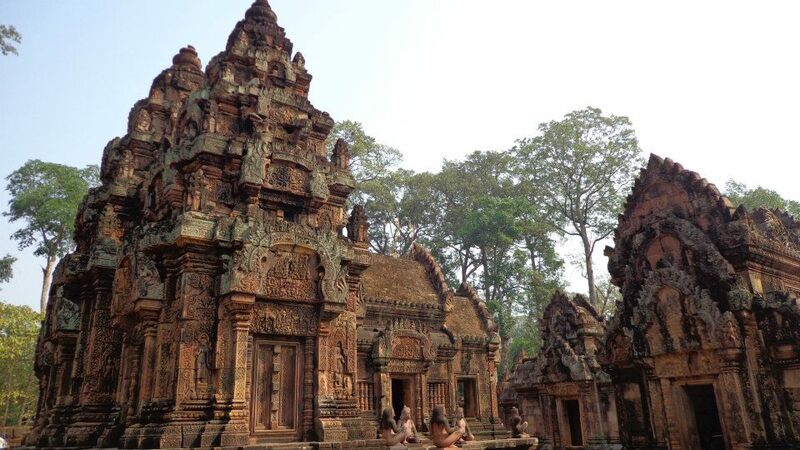 Banteay Srei is one of many temples in Siem Reap that were dedicated to Hindu gods. This particular temple is dedicated to Shiva. 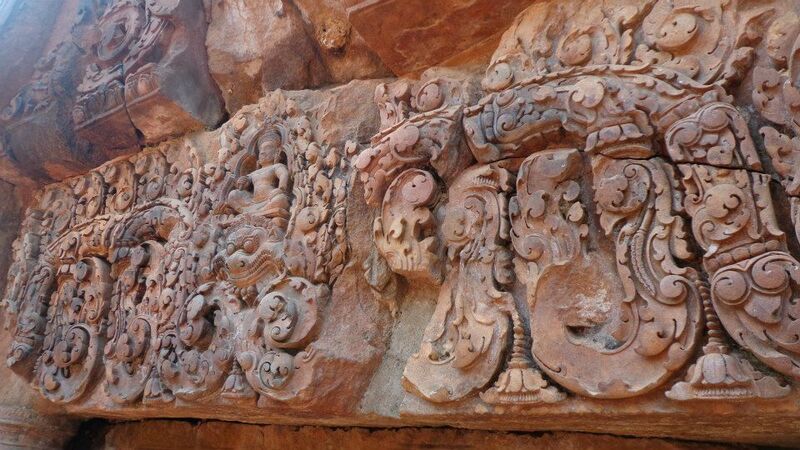 Banteay Srei is made of sandstone which gives it its red color. Sandstone made it easy for the makers of this temple to carve intricate designs that are unmatched in the archaeological park. Banteay Srei is the only major temple in Angkor that was not erected by a monarch. 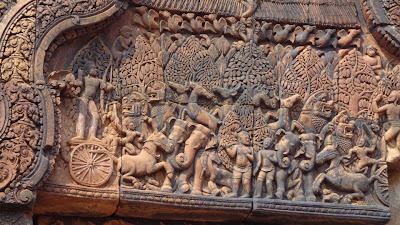 The construction of Banteay Srei is credited to a courtier Yajnavahara. 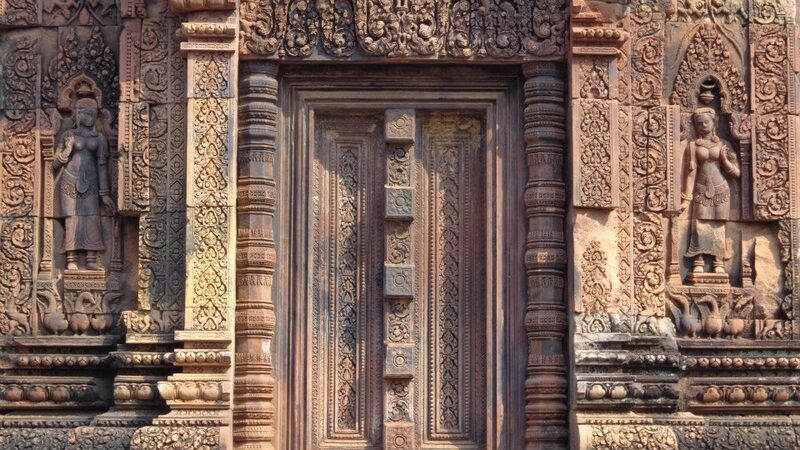 You can clearly see the intricate carvings on the sandstones that are in Banteay Srei. The name of this temple translates to citadel of beauty. 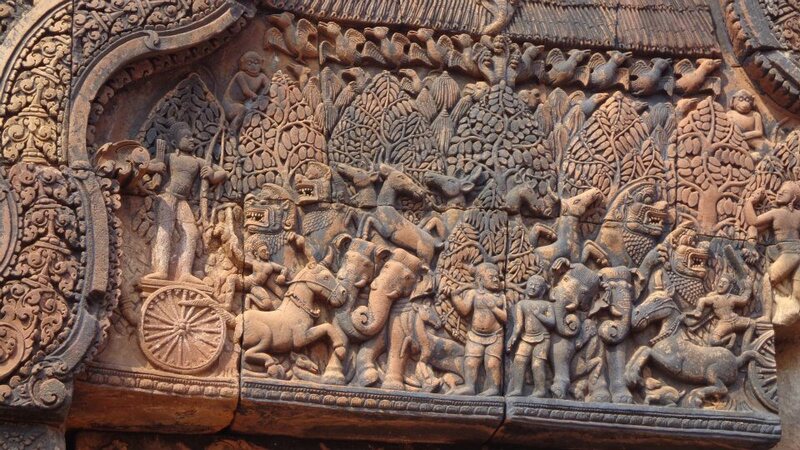 The intricate design of the bas reliefs is attributed to the craftsmanship and artistry of the ancient Khmers. 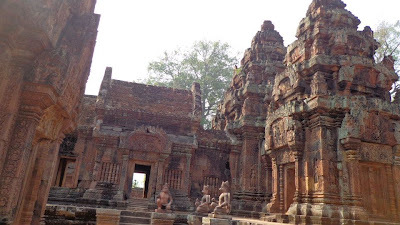 Banteay Srei was small in size compared to the other temples in the Angkor archaeological park. 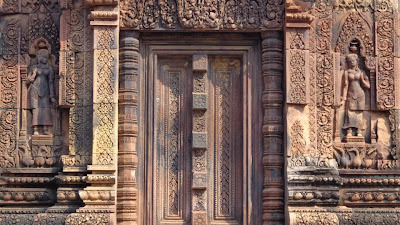 Despite its small size, tourists flocked Banteay Srei. The intricate carvings was a definitely a plus for me. We ran into some monks who were taking pictures of the temple. I decided to play around with my camera and took a picture of them, isolating the color of their robes. 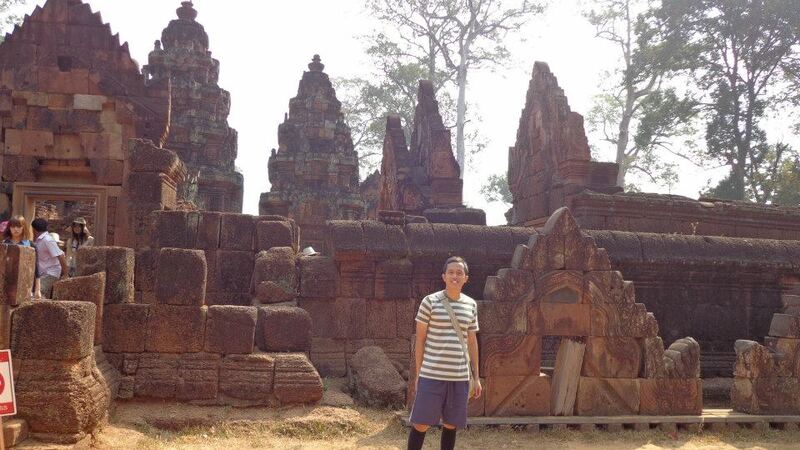 After visiting the beautiful temple of Banteay Srei, our next stop was Banteay Samre. This temple had fewer tourists or we just came at the right time where most tourists have already visited this temple. banteay Samre was erected by Suryavarnaman II and Yasovarnaman II in the 12th century, this temple also followed the design of Angkor Wat. There were hardly any tourists inside this temple. There is something about ruins that makes me keep coming back. it must be the history in its corridors and behind its walls that intrigues me so much. Just wandering in Angkor Wat and the other temples in the archaeological park leads you to the question 'How can such a great empire disappear in a matter of years and fall into poverty?' I have my own answer to that question and I'll leave your answer up to you. Visiting the far flung temples of Banteay Srei and Banteay Samre were worth my time, plus I got to see the Cambodian countryside that resembled the Philippines. I saw these too when I was in Angkor Wat and the carvings are really intricate and defined. Amazing how they did this in the 12th century. Oh wow! 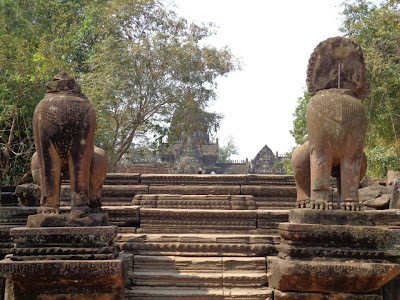 The Ruins of Banteay Samre and the temples in Bantaey Srei are beautiful! 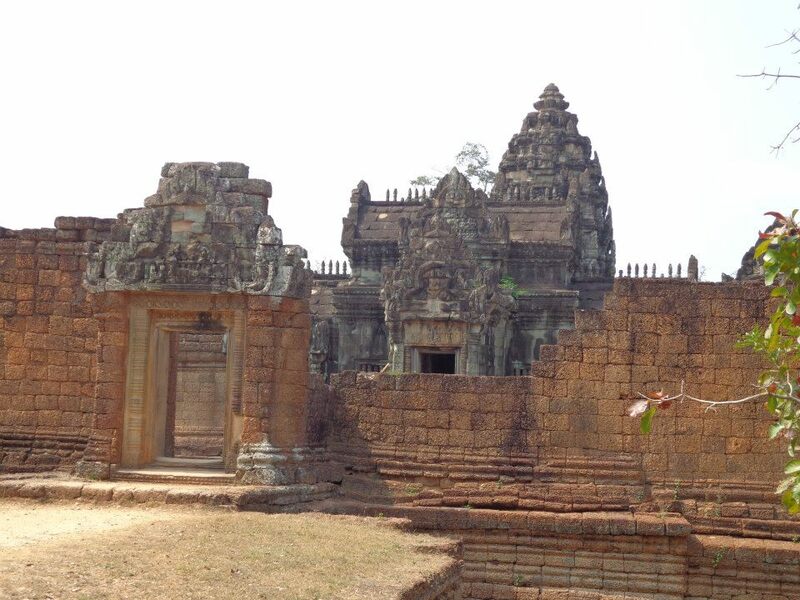 I didn't know much about the ruins in Cambodia until this post. Amazing! 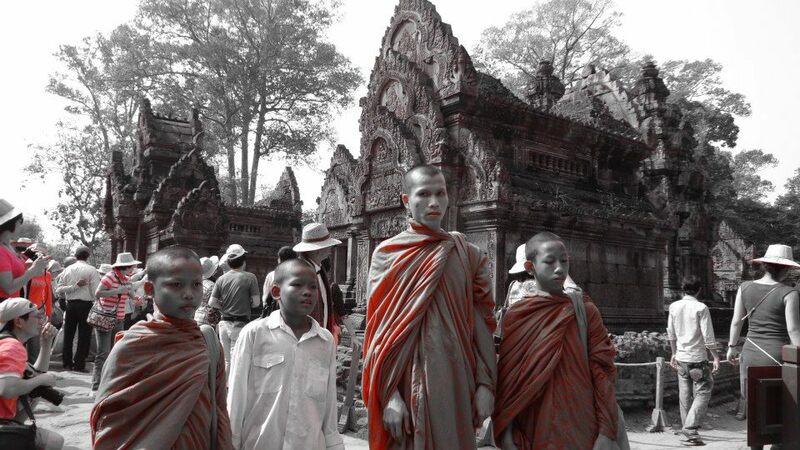 That completes your experience in Cambodia! Those are really beauitful photos of the ancient ruins. Great work of art from the past! So old and full of history! Even looking at the photos you can feel the wonder of the place. Its a destination that I'm eyeing to visit since 2011, because i was so fascinated on how they build those structure that up to this day still look so wonderful. I just met a friend today and we talked about tripping in Cambodia. I don't think I'll like it there because the most I want to see in other places are food and fashion haha. Such beauty! Did they have a tour guide that explained the history of the place & the carvings on the walls? These are really beautiful ruins and I have a lot of places in mind to visit too. What a beautiful site. The intricate designs of those ruins are really fascinating. @Joey: there are tour guides but we decided not to get one. This is an amazing place.Every travel enthusiast should never miss to visit here. historical architecture designed was indeed amazing, unparalleled today. .
Wow. This is astounding. I couldn't imagine how you felt when you encountered it first hand. :) Nice post, man. cool!! like the intricate details.. love the architecture!